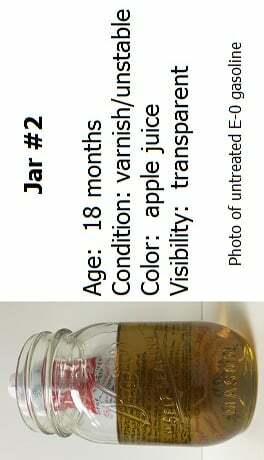 Question: What’s in the 3 jars? 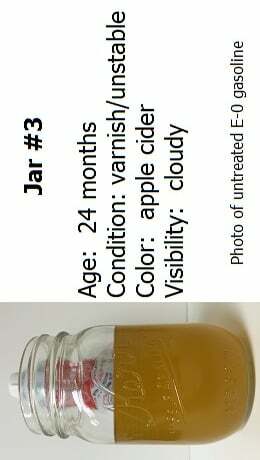 The difference between the 3 jars in the photo is the age and stability of the gasoline. 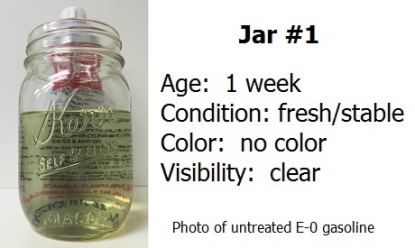 Each jar contains E-0 gasoline (has zero percent ethyl alcohol) drawn from three different outboard engine tanks. 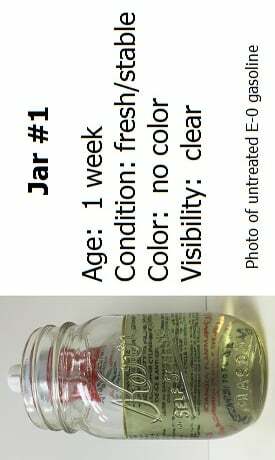 The clear gasoline in Jar #1 is fresh and stable while Jars #2 and #3 have degraded over time. 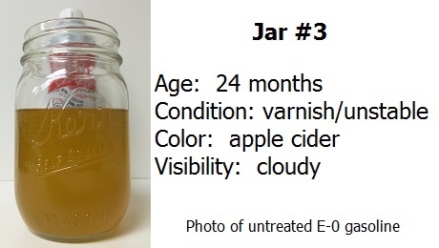 So the quick visual lesson is that stable gasoline is clear, no color, and highly volatile. Gasoline that shows color is less stable and less volatile. If you’re interested in learning what’s meant by “stable” and “unstable” fuel, please read on. Ethanol or not, gasoline degrades quickly as it reacts with heat, ultraviolet light, oxygen (tank venting) and ozone. Within 3 to 4 weeks, untreated gasoline vented to the atmosphere will start to show signs of deterioration through the formation of polymers (unstable hydrocarbon fuel molecules) and the vaporization of light ends (fuel evaporation). The polymers (varnish) will tint the color of the fuel while evaporation causes the lighter ignition vapors to disappear. The result is a progressively darker, heavier, stickier and less volatile fuel. When dealing with degraded fuel, do what you can to remove it from tanks and fuel systems. Gasoline is made up of petroleum hydrocarbon fuel molecules. 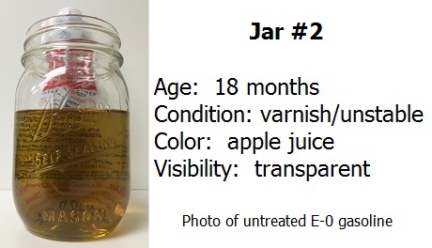 We all know gasoline is a liquid, and depending on age and exposure, newer gasoline goes from light and stable (Jar #1) to heavy and unstable (Jars #2 and #3, varnish and gum) as it ages. In a fuel system, heavier gum and varnish will impair fuel injection and carburetor passageways and form as sticky residues on parts. The sticky residues build around injector nozzles, intake valves, chamber areas and piston compression rings. From there, soft and sticky residues on parts collect unburned, black-soot-like fuel and oil hydrocarbons that don’t completely burn through in the chamber. Sea Foam works to safely dissolve all forms of hydrocarbon residues and deposits. How does Sea Foam work in fuel? Sea Foam works to prevent or dissolve the various forms of petroleum fuel and oil residues. When added to gasoline, Sea Foam not only helps to dissolve harmful varnish, gum, residues and deposits, it prevents them from forming in fresh fuel, making it an excellent long-term fuel stabilizer. Sea Foam also includes a high-temp oil that lubricates upper cylinders through the exhaust stroke. Sea Foam is not only widely-proven and effective, it shares the same petroleum nature as our fuel – It cannot cause harm to fuel systems and you cannot add too much to fuel. In fact, the more you add to fuel, the better it works to safely dissolve and clean harmful residues and deposits. So remember: Stable gasoline is clear, no color, and highly volatile – Use Sea Foam to keep it that way!